In 2013 the universe brought two people together on the Camino de Santiago, the medieval pilgrim route running east to west across Spain. They were astrologer, Stella Woods, from Australia and Andrea Trevisan, electrical engineer turned spiritual adventurer from Italy. As you follow their journey together over the past two years you come to see the power we all have to work magic in our lives. A few months after walking the Camino, Andrea came to Australia for six months. They visited me as they headed north to Queensland where they dropped in on Thomas Zimmer who produces an annual Astrological Calendar and Moon Planting Guide. That was the beginning of an amazing story which ends with the creation of an Italian Moon calendar (Calendario Ritmi di Luna), published in Treviso and launched in Venice in July 2015. Now that’s magic and manifestation at work – BIG time! A week later Stella made the first sale in Melbourne at the Tarot Guild of Australia’s international conference. 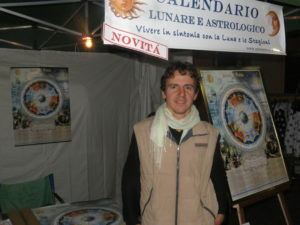 One of the delegates saw us looking at the calendar and said, ‘Wow, that’s the perfect gift for my uncle who’s Italian – I’ll take one!’ Over in Italy Andrea has been setting up at markets and doing the rounds of astrological associations. The response has been universally positive and they’ve just had their first large wholesale order. If you want to buy one for that Italian friend or relative, head over to their website! 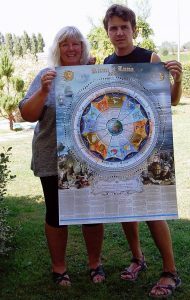 Here I talk with Andrea and Stella about their journey from Tallebudgera to Treviso and the birth of a moon calendar. ANDREA: After we visited you, Linda, we met Thomas and another adventure unfolded. I say ‘another adventure’, because being on a road trip in Australia with Stella, travelling round the country and sleeping in a swag was already a huge adventure for me, but I never imagined it would lead to me working with a whole team of people on an astrological and moon planting calendar – not in my wildest dreams! God moves in mysterious ways… but who would have ever thought of this?!! STELLA: Yes, I remember the morning I woke up and Andrea told me he’d been up all night thinking about creating an Italian Moon Calendar and asked me if I would help him – he was positively buzzing with energy! LINDA: What was it about Thomas’s calendar that inspired you to produce one in Italian for the northern hemisphere? ANDREA: From the earliest days of the ‘adventure’ I wanted the calendar to not only feature useful information, but also to create feelings of harmony and beauty. 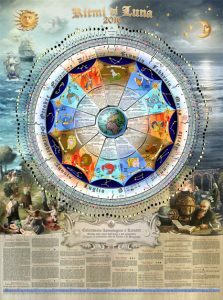 The circular structure of the calendar is similar to the Indian mandala and I deliberately selected imagery with hidden symbolic significance to ensure that when people looked at the calendar, they experienced a sense of peace and emotional balance. Thomas has been producing his Moon Calendar for 40 years. He came up with the idea during the 1970s, a period of great social change and similarly, the release of Ritmi di Luna also coincides with a period of massive change – but this time it’s not youth movements or social justice we’re talking about, it’s more what’s going on inside people’s minds. Nowadays, people have a tendency to shut their eyes and pretend nothing’s going on; they act or behave with a certain attitude or in an extreme manner to try and distract themselves and give the impression of not caring about what’s happening, but in their hearts they feel it… that sense of dissatisfaction… that lack of honest, sincere interaction, that lack of real closeness and a disconnection from the beauty of all life and all things. The main aim of this calendar is to put people back in touch with the natural rhythms of daily life – the cyclical nature of the year – the rise and fall of the seasons. You might wonder how anyone could possibly discover the harmonious nature of life through a calendar, but it is possible! LINDA: What sort of research did you do to judge whether there would be a market for such a calendar in Italy? ANDREA: Actually, I didn’t do any research! When something is born from the heart, logic and financial considerations tend to take a back seat. Now that, with Stella’s invaluable assistance, the calendar has been created and birthed (despite many challenges and difficulties along the way) I’m totally focussed on promoting and selling the calendar. I know I’m still on the uphill stretch, but I also know that it’s important to trust and believe in things! If I look back a year ago, none of this even existed and now here I am, showing off this product which I’ve created along with a whole heap of other people, and I can see that in spite of everything, all the efforts, faith and money invested in the project have been well worth it! LINDA: How did you go about creating the calendar – who did what, for example? ANDREA: In the early stages, I realised I had most of the skills necessary to create a calendar, plus I knew others who could help me out and I was used to coordinating a team. I have an extensive background in technical design, so I created the circular structure of the calendar on the computer. Then Stella – one of Australia’s best known astrologers – did a great job on the written part of the calendar and checked all the astrological calculations, moon positions etc. My brother, a wonderful illustrator, drew all the zodiac symbols. It took a lot longer than I’d first imagined, but along the way I met some amazing people and I’m so grateful to have had their assistance. When I eventually saw the end product, I felt a lot more emotional and excited than I ever did after completing a project in my previous career as an electrical engineer! STELLA: Yes, it really was a team effort, starting with Thomas providing inspiration and ongoing advice; Andrea’s creativity and ‘three planets in Virgo’ obsession with detail coupled with months of hard work; my own Virgo-fuelled obsession with detail plus my background as an astrologer, translator and proof-reader. Then there was Matteo, Andrea’s brother who hand-drew the zodiac symbols and Max Rambaldi who created all the beautiful medieval imagery under direction from Andrea – what a talent! Not forgetting our translator Katia, Italian proof-reader Marco, web designer Steve and the printers at Centro Grafico. LINDA: Just nine months after the idea was conceived, there you were holding your ‘baby’ in July at its launch in Venice. This is so much a story of setting an intention and manifesting a dream. Did you navigate your way by the stars and other divinatory tools such as Tarot? 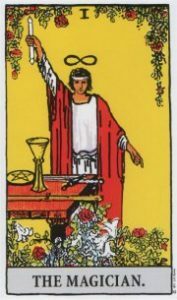 From the Rider Waite Tarot published by US Games Inc.
STELLA: Andrea is a practising Catholic and when I met him on the Camino de Santiago, a traditional Christian pilgrimage albeit with pagan origins, I wasn’t at all sure how he would react to my way of seeing the world. I ‘came out’ long ago as a Tarot reader, astrologer and lover of all things esoteric and have unashamedly practised the techniques of magic and manifestation since I was a child. How refreshing therefore to find out that Andrea’s view of ‘God’ and the gifts he provides were completely identical to my view of ‘The Universe’ and the gifts the universe provides. So, in answer to your question, yes we did navigate our way by the stars and the Tarot (he and I have both studied Tarot), but to quote Andrea “If you allow God to guide you, he’ll take you to a place you didn’t even know existed and offer you the chance to rediscover yourself …reinvent yourself… then he’ll dress you in a new outfit and invite you to a party… stuff you’d never imagine in your wildest dreams?! !” And as for our ‘baby’, it was exactly nine months from the day Andrea came up with the calendar idea to the day we picked up the calendars from the printers – amazing! Throughout the creative process we prayed, we consulted the Tarot at key points (choosing the right printing firm for example) and I, being an astrologer, of course checked that our natal charts were compatible and that we’d be able to work together. For those of you who understand such things, we’re both fire signs (passion/creativity), both have lots of planets in Virgo (attention to detail), plus we have a massive nine planet stellium in our composite chart with the Sun, North Node, Saturn, Ceres and Mercury all within a 6 degree orb. And before we spent one cent on the project we did a Tarot spread in Melbourne to see how the whole thing would turn out – the results were 100% positive. Quite recently I had a dream that we had both been Knights Templar in a previous life and brothers in arms – who knows if that is true? But what I always admired about those spiritual warriors is that they understood the power of universal forces and I’d like to think those same forces have helped us create this calendar. LINDA: How important is it for people to call on ‘magic’ to manifest their dreams? STELLA: I can’t imagine trying to manifest a dream without calling on higher forces. You can call it magic, the Universe, God, your spirit guide, your mentor, your animal totem – it’s all the same thing – I find it impossible to distinguish between different religions and belief systems. Perhaps that’s because I’m a Sagittarian and like to look at the big picture. I teach my students that they can try and do things on their own or speed things up a thousand times by calling on higher powers, such as magic. LINDA: On now to the calendar itself….what are the main features? ANDREA: Well you can read all about the features on our website at www.ritmidiluna.com but briefly, the calendar is a wall poster showing the lunar cycle including new moons, full moons and eclipses plus the zodiac sign of the moon on any given day and the position of the sun. There’s lots of advice on gardening and planting by the moon and how to plan your daily activities in tune with the moon. There are also guidelines for when to cut your hair, wax your legs, go for a beauty treatment or bottle your wine. We also have stuff on Mercury retrograde, eclipses, void of course moons and individual star signs – there really is a lot of great information on this calendar! LINDA: What sort of evidence is there that planting by the moon works better than just planting any old time? STELLA : People have been planting by the moon for thousands of years – because plants are composed of mainly water, they respond to the push and pull of the moon’s gravity, just like the tides and the female monthly cycle. Some parts of the lunar month favour planting, while others favour harvesting. LINDA: The calendar has been designed for the northern hemisphere, but presumably you could add or subtract hours according to your time zone anywhere in the world? ANDREA: Yes of course you can. We’ve set the calendar for the Central European Time Zone, which covers most countries in Western Europe. Those in Eastern Europe need to add an hour to the listed times. Those in the UK and Portugal need to subtract an hour from the listed times and those in the States, Canada, Australia or New Zealand need to add or subtract hours depending on their time zone in relation to Central European Time (GMT +1). LINDA: How are you promoting the calendar? 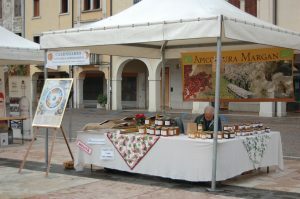 STELLA: Andrea has been selling the calendar at fairs and markets in northern Italy, we have a website where you can buy the calendar online plus a Facebook page (Ritmi di Luna Calendario) and we’ve recently started the hard work of promoting the calendar to stores in Italy and through astrology associations, gardening clubs etc. As this is a long term project, we are taking the time to set up the infrastructure for growth. And of course there’s Instagram and other social media. People so far have loved the calendar and that’s very encouraging. LINDA: I feel sure something else will emerge from such a creative partnership…any idea on what’s next? STELLA: After six weeks together on the Camino de Santiago, 90 days camping in the Australian bush, a 20,000 km road trip round Australia plus all the months we’ve spent on this calendar both in Australia and Italy, I’m still not sick of him, so maybe we’ll do something else together someday, but for now we have our hands full with Ritmi di Luna! ANDREA: We’ve talked about expanding into different countries and different languages – that would seem to be the logical next step. And educating people about astrology, their personal birth chart and how they can live in harmony with nature. Does the story of Andrea and Stella’s adventure inspire you to think beyond the current boundaries of your life? Do you have a story about manifesting a dream? We’d love to hear from you.